Vice President Dr. Mahamudu Bawumia, has said the GHc 1.2 billion debt the Akufo-Addo administration met at the National Health Insurance Scheme (NHIS) has finally been cleared. 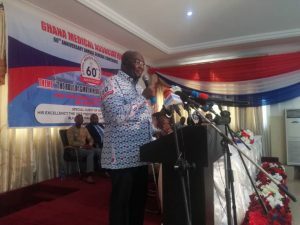 Speaking at the 60th Annual General Conference of the Ghana Medical Association, Dr. Bawumia said Ghanaians will now start seeing improvement in the Scheme. The National Health Insurance Authority (NHIA), has long held that the Scheme had run out of funds to operate. “Between 2009 and now, we have just been piling debts,” the NHIS CEO, Dr. Samuel Annor admitted to Citi News earlier. “Since we have been in office, this GHc 1.2 billion debt that we inherited, which covered from 2014, 2015 and 2016, has now been fully paid off,” the Vice President added. The Vice President then challenged the CEO and the authorities at the NHIS to ensure the enrollment of Ghanaians onto the Scheme through a digital online platform to lessen the burden and stress people go through before getting access to their cards. The Vice President also indicated that procurement processes have begun for the acquisition of ambulances for every constituency in the country. “…So the procurement has began, and definitely in 2019, you will have every constituency; at least 275 ambulances; they are coming, and I think it will be very helpful for us,” he added. The post ‘GHc1.2bn NHIS debt inherited from NDC fully paid off’ – Bawumia appeared first on Citi Newsroom.